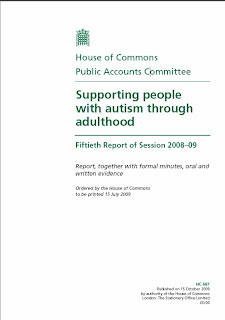 The House of Commons Public Accounts Committee's report "Supporting people with autism through adulthood" identifies that GPs and primary care practitioners "do not currently have sufficient knowledge and awareness of autism". It's not surprising because my own father who's a pathologist, also indicated his lack of understanding of ASD. He only started researching autism after learning that his own grandson was diagonised with it. The report also mentions that there are around "400,000 adults with autism in England, around half of whom have a learning disability (sometimes known as ‘low-functioning’ autism), while half do not (‘high-functioning’ autism, which includes Asperger Syndrome)". I was shocked to learn that only around 15% of people with autism are in full-time employment. This reveals a that autistic people are being discriminated against and I am wondering whether it might be a better strategy if people with ASD did not reveal that they were autistic while searching for a job.